All of this is codified in one form or another in US political and military doctrine. Every American president from George Washington to Barack Obama has trumpeted in some fashion what President Obama and President Bush George W, Bush both proclaimed. The former indicated that the US will pursue its own interests no matter what any other nation on the planet thinks, even invoking God’s plan to put the care of the global environment in America’s hands. The latter put it more simply, “You are either with us or against us.” The heads of foreign governments—and their opponents– are well aware of US strategy, tactics and operations. In the middle of this sits the US Department of Defense and the military branches of the US government. While they certainly advocate for their budgetary interests, have their share of drunks, overstep the civil-military divide, and engage is occasional battlefield atrocities, the fact is that they take their guidance and instructions from American civilians who are elected and appointed to provide the guiding strategy—and funding–to which the military designs its own strategy, tactics and operations. The combination of financiers, investors, technocrats and politicians is toxic. They run the world with formulas and a market ideology that has long since past its prime. They simply write off as “bad debt” large swaths of world’s population—to include in the United States and European Union—as unemployable, uninsurable. Once they have jettisoned those millions from the official economic figures, the economy magically improves as investors get excited. They claim that taxes stifle corporate investment when, in fact, corporations pay very little taxes thanks to politicians. Incredulously, they seek a move to the free market in a time of growing poverty, inequality and unrest. As a placard in Bosnia Herzegovina put it, “I am hungry in three languages.” So when global rebellion comes in dozens of languages–based on the simple desire for the “right” to be secure in work, food, shelter and clothing–spills over to one country after another–to include the USA–the financiers, investors, technocrats and loathsome politicians will turn to the American national security apparatus to protect them, most likely by fighting in a foreign land already in the midst of a civil war or open rebellion. 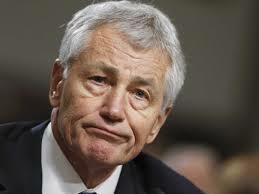 Hagel should say No.